Fishing enthusiasts will find the lakes, rivers and streams on the Ebbetts Pass National Scenic Byway abundant with rainbow, brown, and brook trout. Popular and readily accessible lakes with planted trout include White Pines Lake, Spicer, Union and Utica Reservoirs, Lake Alpine, and Mosquito, Highland, and Kinney Lakes. Fly fisherman in search of wild trout can challenge themselves on the North Fork of the Stanislaus, Mokelumne and East Fork Carson Rivers, as well as on variety of smaller streams that require some hiking to reach. 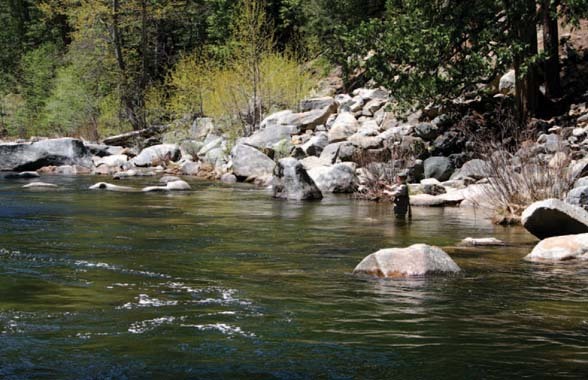 Major Stanislaus River access points along the byway include Calaveras Big Trees State Park, Sourgrass, Gann’s Meadow trail, and Spicer Reservoir Road, while easy access to the Mokelumne River is available in Hermit Valley. Mokelumne River tributaries including Deer Creek, Pacific Creek and Highland Creek also offer excellent trout fishing opportunities, as do east side streams such as Wolf Creek, Noble Creek and Silver Creek. The East Fork of the Carson River provides exceptional fishing opportunities, and is home to the rare Lahontan trout. Some of the more remote streams and lakes in the area support native populations of cutthroat and golden trout as well.